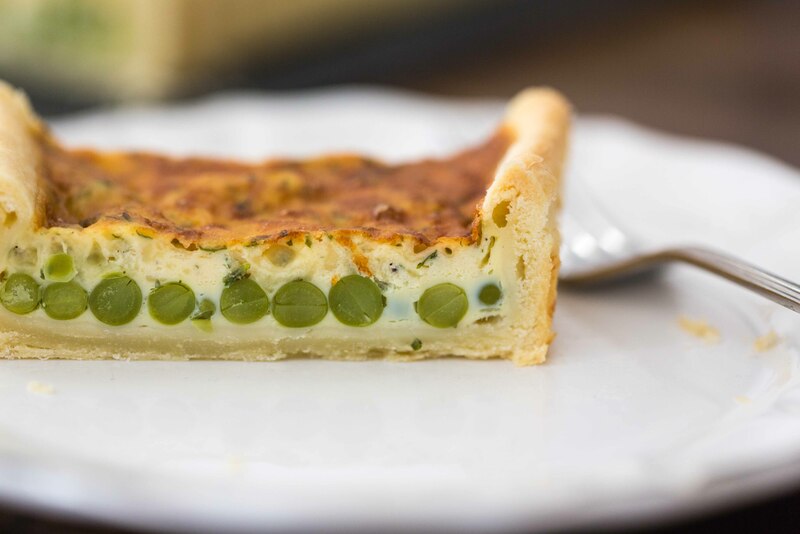 A simple yet tasty quiche recipe using fresh peas and a strong cheese. This looks great on any spring lunch table! I like to serve it with a simple salad of arugula and parmesan. Preheat the oven to 350°F. Grease a 10″ quiche tin or a 13 x 4 inch rectangular baking pan with butter. Fill a large bowl with ice water. Bring a large saucepan of salted water to a boil. Add the peas and boil until tender, about 3 minutes. Using a slotted spoon, transfer the cooked peas to the ice bath. Once cooled, drain the peas and set aside. On a lightly floured work surface, roll out the shortcrust pastry until it is about ⅛-inch in thickness. Line the prepared tart tin with the pastry, making sure not to stretch it. Roll your rolling pin over the top to trim any excess and prick the base of the pastry all over with a fork. Chill in fridge for at least 15 minutes. This helps the pastry relax and reduces the chance of it shrinking when you bake it. In a bowl, mix together the eggs, crème fraîche, cheese, parsley, nutmeg, salt and pepper until well combined. Once chilled, remove the pastry-lined tart tin from the refrigerator and sprinkle the peas all over the bottom. Pour over the egg mixture and smooth out with a spatula if necessary. Bake in the oven until the pastry is golden brown and cooked through and the filling is set, 30 – 35 minutes. Remove from the oven and allow to cool for 5 – 10 minutes before serving.